So, let me just put it out there: Canis Restaurant is now one of my favourite restaurants in Toronto. 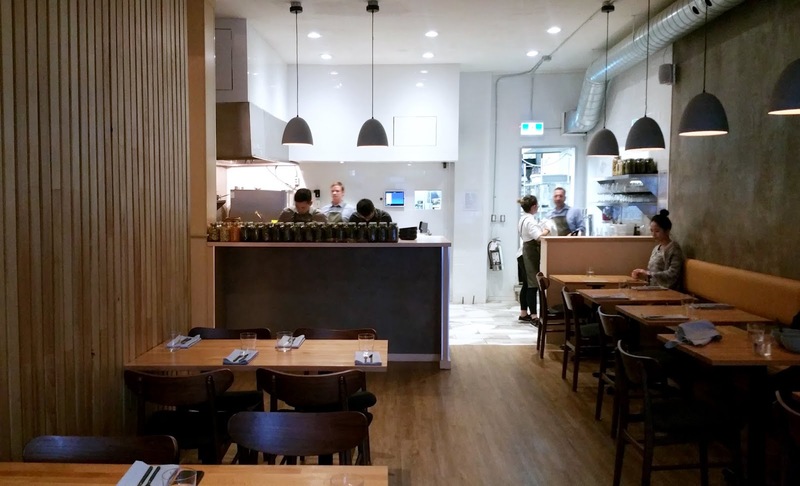 Canis, which opened a month ago on 746 Queen Street West, does upscale, yet approachable, Canadian cuisine. Their menu is intricate, thoughtful and original. Canis is good. Real good. 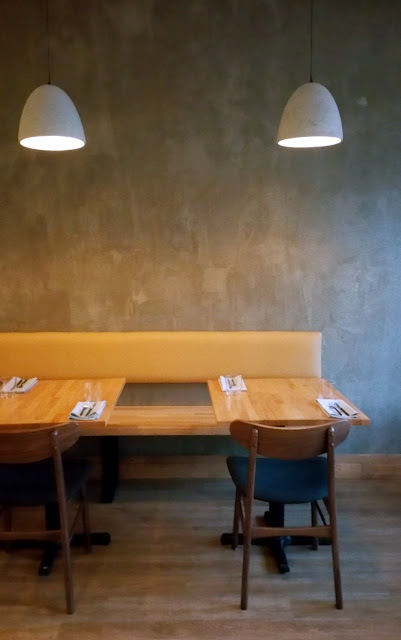 The interior of Canis is sleek and modern with a bright open kitchen at the back. The modest dining room features mostly concrete, wood and leather. To start, my friend opted for beer (below) while I opted for a glass of bubbly (not pictured). Canis' dinner menu is divided into snacks, starters, mains and desserts. I asked chef Jeff Kang if he could just bring out dishes for us since we do not have any allergies and we eat everything. So, here we go! 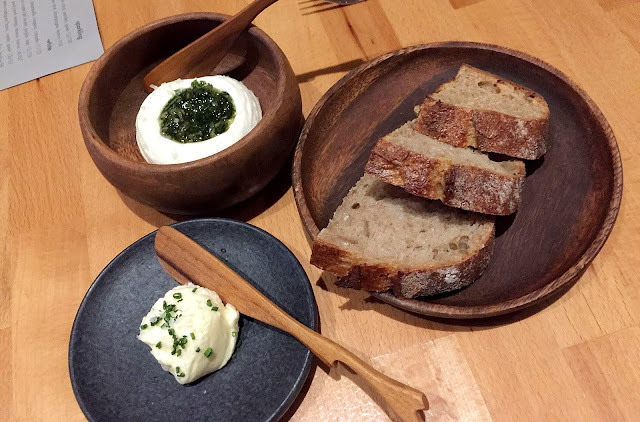 Sourdough from Clark's Bread served with whipped garlic butter, and fresh ricotta & chimichurri. Mix together the cheese and chimichurri, and you'll literally get the best spread ever. The garlic in the butter was a bit too subtle for my taste (I love my garlic) but the sourdough was excellent. Made in-house and cured for four months, the lonza had a taste and texture similar to a mild prosciutto. The lonza and the grainy mustard was nice with the sourdough bread. Canis' creative take on a popular Middle Eastern dish. Topped delicately with charred eggplant puree, pickled cauliflower, dill and cilantro, these are by far the fanciest (and most flavourful) falafel I've ever had. The falafel - made with cauliflower, chickpea flour, feta cheese and spices - were crisp on the outside, and light, a little crumbly but moist on the inside. Ontario Rainbow Trout with cured trout horseradish cream finished with a dill oil drizzle. Thinly shaved baby pickled cucumbers and radishes meticulously divide the pieces of trout. So pretty. Looks like dessert, doesn't it? I have enjoyed many chicken liver mousse but never in tart form. Chicken liver mousse - usually served in a vessel where one would spread it on crackers or bread - is, instead, a tart filling here. Love it. The glistening layer of sour plum glaze was outstanding. Not only was the glaze visually appealing, it also served to cut the richness of the mousse in the most delicate way possible. Overall, this was a very well-balanced dish. The thin, yet sturdy, crust held the tart's structure beautifully. Again, Canis does things differently here. Unlike conventional presentations of beef tartare, the tartare is difficult to stop here since it's all covered in greens (parsley, mustard leaf, watercress, nasturtium) with a light dusting of kale powder. However, once you mix everything together, the beef tartare is revealed at the bottom, along with slivers of pickled shallots and crispy potato chips. The chopped tartare, dressed in white anchovy and mustard, was nicely seasoned and very tasty. I also enjoyed the bit of crunch from the sunflower seeds. Ricotta stuffed agnolotti and maitake in a corn butter sauce. The earthiness of the mushrooms and the sweetness of the corn sauce both stood out equally. This was an excellent flavour combination. The stuffed pasta worked perfectly in showcasing the robust flavours in this dish. I apologize in advance for the terrible photo (those apple batons look more glow sticks). Anyway, would it be cliche of me to say that the flavours and textures here are in perfect harmony? Each bite of foie gras was breathtakingly delicious 'cause every component on this plate did their part in elevating the foie; the sweet and smooth apple puree, the crisp and tart green apple batons, and the crunchy walnut streusel all worked together to balance the rich and decadent, melt-in-your-mouth foie gras flawlessly. Bravo. Chef Kang brought the duck breast over to my table and from that point on, I couldn't take my eyes off the duck (thinking back, I realized how rude I must've been since I was looking at the duck the entire time chef Kang was explaining how it was prepared!). This had to be the most beautiful duck breast I've ever seen. I really didn't want chef Kang to take it away - a part of me wanted to grab that entire duck breast with my bare hands and eat it like a caveman (unfortunately, chef Kang eventually took it to back to the kitchen for plating). I've never had dry-aged duck before, and if aged duck tastes like this one at Canis then damn, I don't want to eat fresh duck ever again. Dry aged for 14 days then roasted with honey glaze, this had to be the best duck breast I've ever tasted. It would seem like dry-aging duck has the same effect as that of dry-aging beef; internal moisture within the muscles diminishes, thereby strengthening the flavour and tenderizing the meat (without the internal moisture the fiber structure of the muscle tissue breaks down and becomes tender). Sliced into perfectly portioned pieces and served with wheat berry, caramelized onion puree, toasted pearl onion and pickled pearl onion, each piece of duck was amazingly juicy and tender. Jus gras - made with duck liver and sherry, and poured table-side - really heightened the flavour of the duck breast, too. Long story short, this duck was off the hook! Easily the best plate I've had this year. One should not leave Canis without having this duck. A subtle chocolate mousse served with buckwheat ice cream, honey and candied buckwheat, all buried beneath light buckwheat meringue pieces. Since I love my chocolate desserts rich, bold and decadent, this dessert was too light for me. Nevertheless, I did appreciate the toasty buckwheat elements and honey here. The icy fermented Concord grape granita, freshly peeled grapes, and sweet brown butter crumble topping presented a lovely texture boost to the smooth and refreshing buttermilk ice cream. This dessert was a superb ending to the dinner. 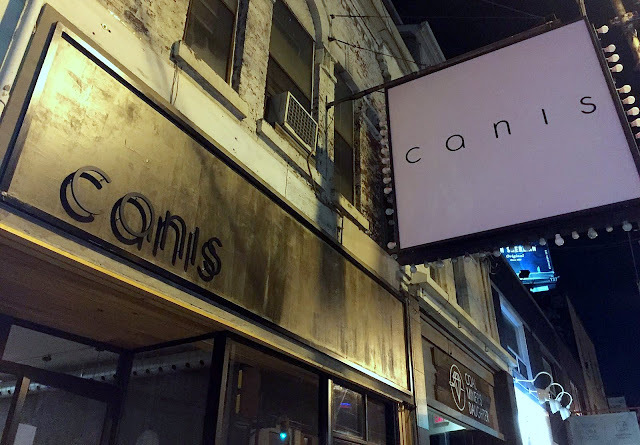 Canis (Instagram: @canisrestaurant, Facebook: Canis Restaurant) certainly debuted in Toronto with one stellar menu. I'm thrilled that a restaurant of this calibre is now in Toronto. What more can I say? Run, don't walk to Canis!